In the UK, Android has increased its OS market share by 19 percent from 42 percent share of the market in May 2012 to 50 percent in the three month average ending May 2013. Apple’s market share amongst the 33.1 million UK smartphone owners has remained relatively stable, with a growth of 7 percent from May last year to reach 29 percent share in May 2013. Amongst the other 3 players in the market, Microsoft has seen a big jump over the year from 3 percent market share to 5 percent – a growth of 87 percent. 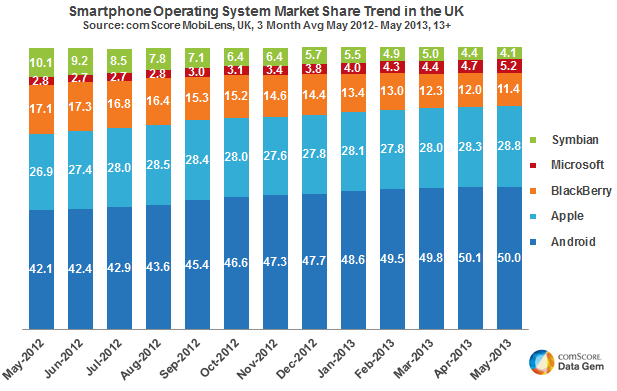 In comparison, Blackberry and Symbian have both seen a decrease in their share of the UK OS market.